1. Conference.lds.org has conference talks back to 1971 in text, and more recent talks in video, audio, PDF, and EPUB in many languages. Also in the Gospel Library app. 2. BYU has an LDS General Conference Corpus that lets you search the 24 million words in the 10,000 talks given from 1851 to 2010 in English. 3. 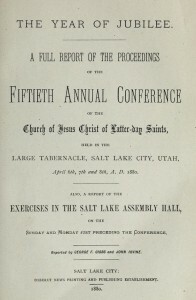 The Church History Department has scanned all the General Conference Reports in English since 1880 and placed them online in the Internet Archive, a non-profit Internet library. 4. BYU’s LDS Scripture Citation Index (scriptures.byu.edu) has the text from conferences from 1941 to the present. You can search them or check references in all conferences to a given scripture passage. Thank you! That is great! I am going to thoroughly enjoy using these links! Wonderful resource for talks and back history. Thank you for your efforts in putting this list together for the rest of us. Have only been a subscriber for a few months and have enjoyed every article.